Shanghai Airlines (Chinese: 上海航空公司; pinyin: Shànghǎi Hángkōng GōngSī; Shanghainese: Zånhae Onkoen Gungseh) is an airline headquartered in Shanghai, China. 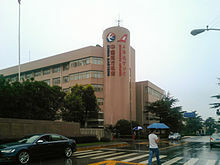 It is a wholly owned subsidiary of China Eastern Airlines, but its operations remain separate post-merger, retaining its distinct brand and livery. Shanghai Airlines operates domestic and international services. The logo is a white crane on a red vertical tail fin. The airline operate flights out of Shanghai Pudong International Airport and Shanghai Hongqiao International Airport in Shanghai. The airline is an affiliate member of the SkyTeam airline alliance with its parent company China Eastern Airlines which is a full member of the alliance. Shanghai Airlines was established in 1985. It is China's first commercial airline of multidimensional investment funded by the Shanghai municipal government and Shanghai local enterprises. The airline was initially restricted to domestic flights, but has operated international services since 1997. In late 2002, Shanghai Airlines was successfully listed on the Shanghai Stock Exchange, which enabled the airline to fuel its further expansion. In 2006, the airline's cargo subsidiary was founded. On 12 December 2007, Shanghai Airlines was officially welcomed as the 19th member of Star Alliance, which consolidated the alliance's presence in the Shanghai market. On 11 June 2009, it was announced that Shanghai Airlines would merge with China Eastern Airlines. The merger of the two airlines was expected to reduce excess competition between the two Shanghai-based carriers, and allow them to compete more effectively with domestic rivals Air China and China Southern Airlines. It was also aimed at consolidating Shanghai's status as an international aviation hub. In February 2010, the merger was completed. Shanghai Airlines was delisted from the Shanghai Stock Exchange and became a wholly owned subsidiary of China Eastern Airlines. The new combined airline is expected to have over half of the market share in Shanghai. Prior to the merger it was headquartered in Jing'an District. As a result of the merger with China Eastern Airlines, Shanghai Airlines reached an agreement with Star Alliance to terminate its membership. On 1 November 2010, the airline officially left the Star Alliance and announced its intention to join its parent company in SkyTeam. Shanghai Airlines also maintained its own cargo division, Shanghai Airlines Cargo, which was merged into China Cargo Airlines. Shanghai Airlines has a substantial domestic network shared with its parent company China Eastern Airlines. The airline serves over 140 domestic and international destinations, giving access to more than 60 large and medium-sized cities in Mainland China and abroad. Its international flights focus on Hong Kong, Macau, Taiwan, Japan, South Korea, Indonesia, Singapore and Thailand. Shanghai Airlines also operates services from Shanghai to Melbourne Airport, Australia on behalf of China Eastern Airlines utilising its own aircraft and crew. From June 2019, Shanghai Airlines will operate direct flights to Budapest Ferenc Liszt International airport. Airbus A330-300 2 — — 38 — 262 300 To be returned to China Eastern Airlines. Boeing 787-9 4 6 4 26 28 227 285 Deliveries until 2019. Order placed by parent company, China Eastern Airlines. Boeing 767-300 4 1994 2018 Last flight was on 30 September 2018. Crane Club (simplified Chinese: 金鹤俱乐部; traditional Chinese: 金鶴俱樂部) was the frequent-flyer program of Shanghai Airlines prior to the merger with China Eastern Airlines. However, Shanghai Airlines announced on April 2011  that the Crane Club will be merged into China Eastern's Eastern Miles Program. It was officially merged into Eastern Miles on June 8, 2011. After the merger, members can earn and use their mileage on China Eastern's flights. The Crane Club had two tiers: Crane Club Gold and Silver. Shanghai Airlines' frequent-flyer program is called Eastern Miles (simplified Chinese: 东方万里行; traditional Chinese: 東方萬里行). After the merger with China Eastern Airlines, the frequent-flyer programs were also merged. Eastern Miles became the official frequent-flyer program of Shanghai Airlines on June 8, 2011. When enough miles are collected, members can be upgraded to VIP. VIP membership of Eastern Miles can be divided into three tiers: Platinum Card Membership, Golden Card membership and Silver Card membership. ^ "Shanghai Airlines to leave Star Alliance; China Southern expects improved profits: China Share Wrap". Retrieved 10 July 2015. ^ "China Eastern Airlines announces detailed merger plan with Shanghai Airlines_English_Xinhua". Retrieved 10 July 2015. ^ Reed Business Information Limited. "Shanghai Airlines to delist from stock exchange". Retrieved 10 July 2015. ^ Home page. Shanghai Airlines. Retrieved on December 4, 2010. "Head office Address: 212, Jiangning Road , Shanghai, 200041,China" - Address in Chinese Archived 2010-12-04 at the Wayback Machine: "总部地址： 上海市静安区江宁路212号（近北京西路）凯迪克大厦 邮编:200041 "
^ "Shanghai to end Star Alliance membership". Retrieved 10 July 2015. ^ "Profile on Shanghai Airlines". CAPA. Centre for Aviation. Archived from the original on 2016-11-02. Retrieved 2016-11-02. ^ "Shanghai Airlines Fleet Details and History". www.planespotters.net. Retrieved 2018-07-22. ^ "B737-700 - Fleet Information - Flight Experience - Guide - China Eastern Airline". Retrieved 10 July 2015. ^ "Industry News / Opinions - Shanghai Airlines 787-9". Retrieved 2018-07-22. ^ "Shanghai Airlines Fleet Details and History". Planespotters. Retrieved 22 April 2017. ^ "图片 再见了767！上航最后一架767飞机将告别蓝天_民航新闻_民航资源网". news.carnoc.com (in Chinese). Retrieved 2018-09-25.